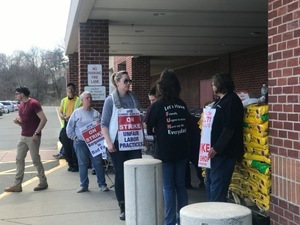 United Food and Commercial Workers (UFCW) and Stop & Shop are currently in negotiations in hopes to come to an agreement and end the strike by employees of Stop & Shop in Connecticut, Rhode Island, and Massachusetts. 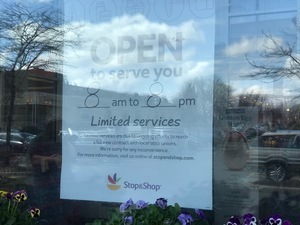 Stop & Shop in Ridgefield is open until 8 pm today, Saturday, April 13, but with limited availability. 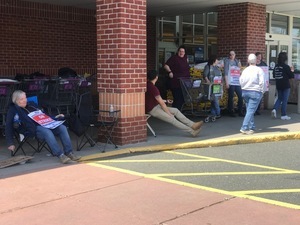 Employees are standing outside the store holding and wearing "On Strike" signs, demanding fair labor practices. According to several of the Stop & Shop employees we spoke to, the last strike happened in 1989 and lasted 17 hours. The clock continues to tick... it's been more than 24 hours since the strike began. 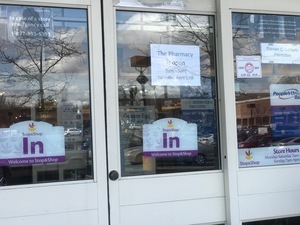 While the pharmacy, People's Bank and Dunkin' Donuts are open, the store shelves have not been restocked since Thursday, when the strike began. Presently, there are no employees working the registers, the store is operating on self-checkout only. Store Managers and the pharmacist, who are not union employees, are on hand to assist customers.